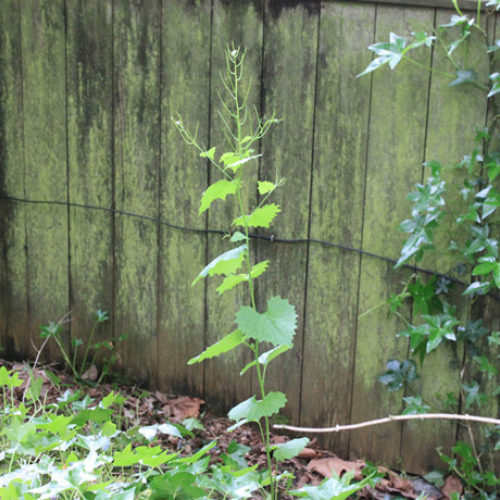 Garlic mustard’s vegetative growth starts early in the spring, outcompeting native and beneficial species that are still dormant. Its ability to reproduce high quantities of seed from a single plant can make it difficult to eradicate once it is well-established. 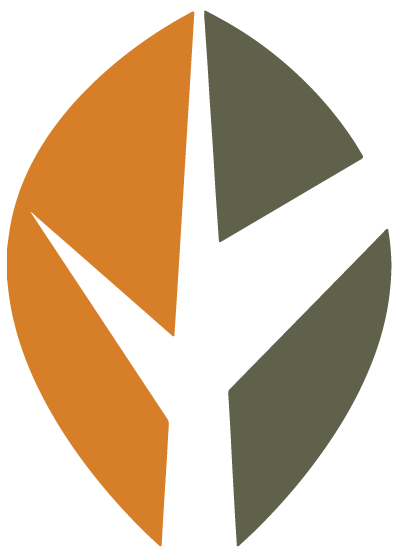 Seeds can survive a number of years in the seedbank, prolonging its ability to dominate a site. 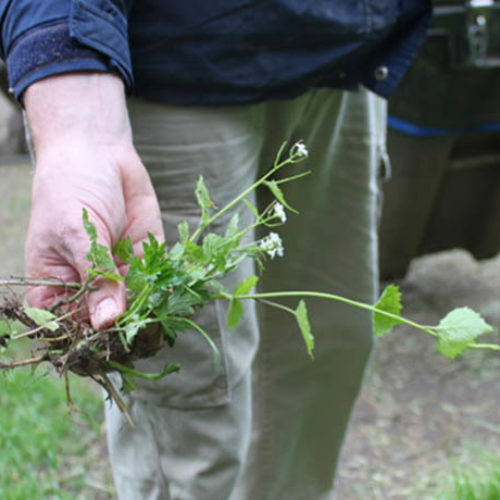 Garlic mustard also changes the composition of a plant community by exuding chemicals that disrupt plant growth and certain plant-mycorrhizal fungi connections, which are important for tree seedling health. 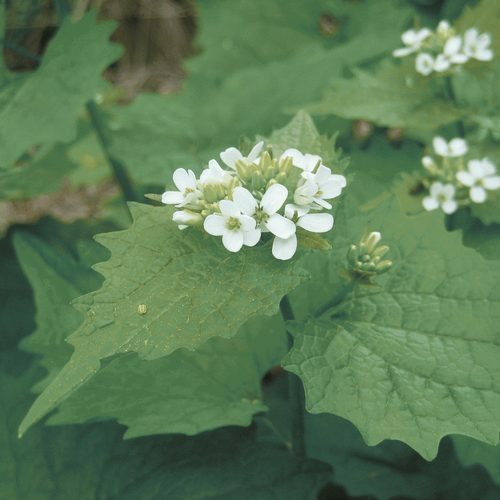 Garlic mustard is a biennial to short-lived perennial plant that is garlic scented and can grow to a height of around 3 feet. Flowers have 4 petals, 4 sepals and 6 stamens. Petals are white, about 1/4 inch long and are twice as long as the sepals. 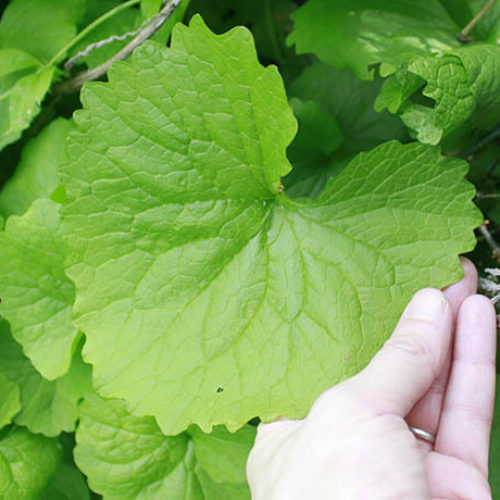 Basal leaves are broad with rounded tips and rounded bases (kidney shaped). 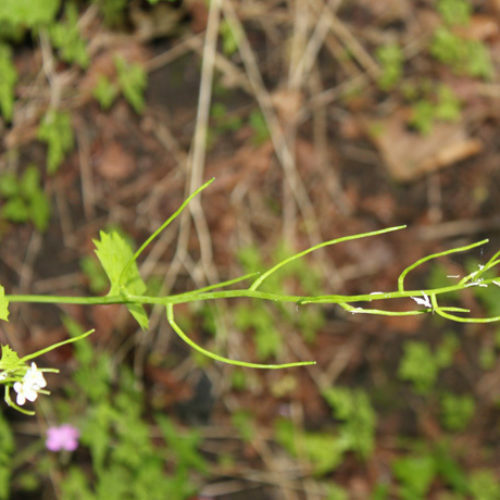 Upper stem leaves are alternate and triangular. 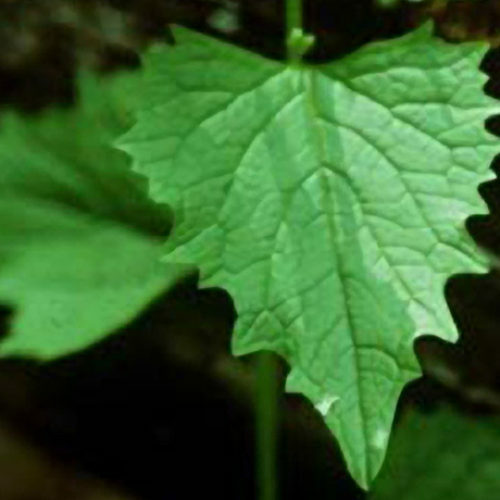 Both leaf types have petioles (leaf stems). Leaf margins are coarsely toothed. New leaves have a strong garlic odor. 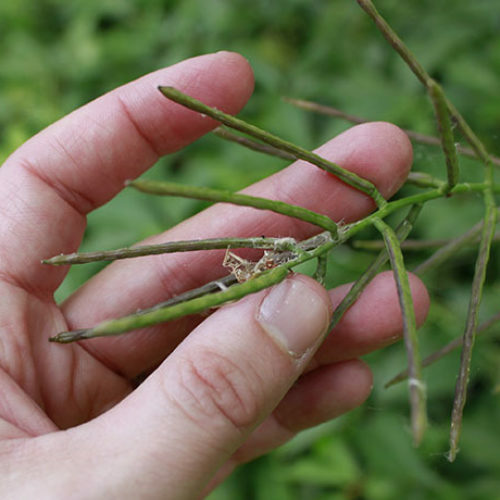 Stems are generally upright and one to many can grow from a rosette (cluster of radiating leaves at base of plant). They may be branched or unbranched. Seed pods long and slender, curving upward, up to 2.4 inches long. Seeds are dark brown to black, grooved and oblong in shape. Plants can produce up to 8,000 seeds. 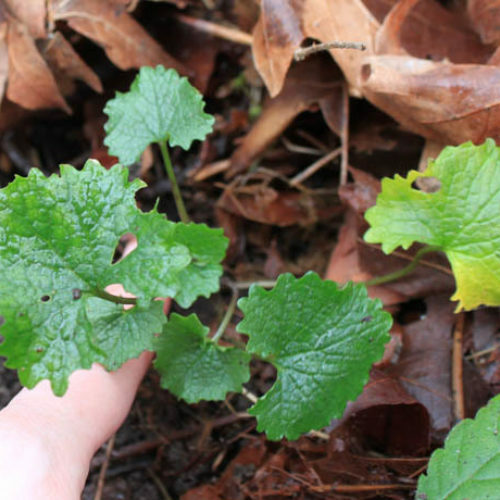 In Washington State, garlic mustard is found in forested understory areas including urban parks, on roadsides, trails, railroad tracks, streambanks, fields, slopes and floodplains. 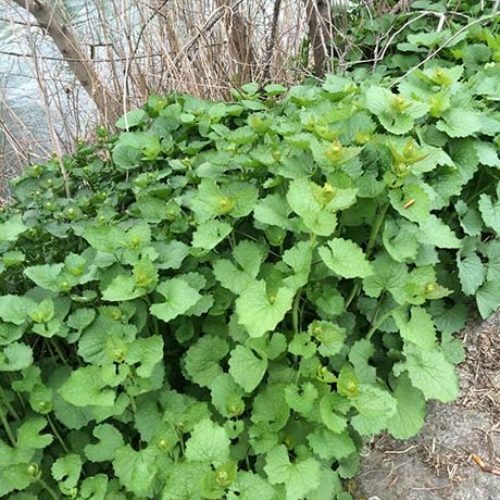 Within the past couple of years, garlic mustard was found in two counties in eastern Washington. 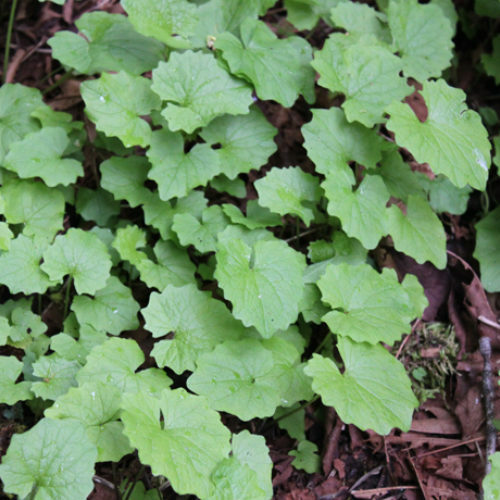 Please click here to see a distribution map of garlic mustard in Washington. 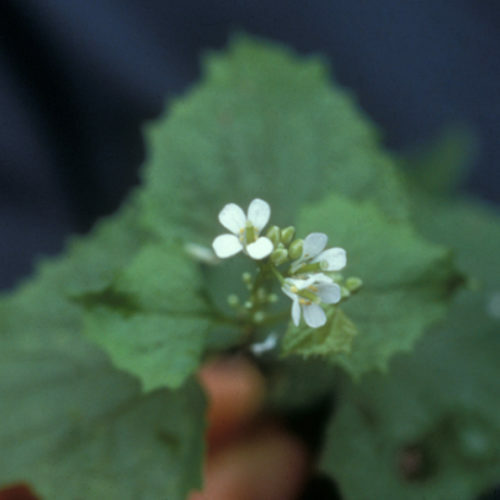 Garlic mustard reproduces by seed. 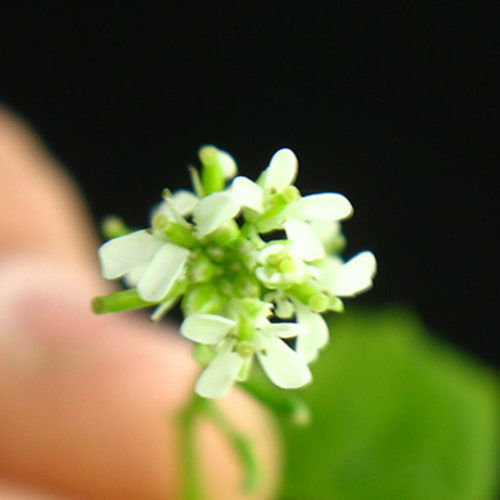 This plant is capable of cross-pollination as well as self-pollination. 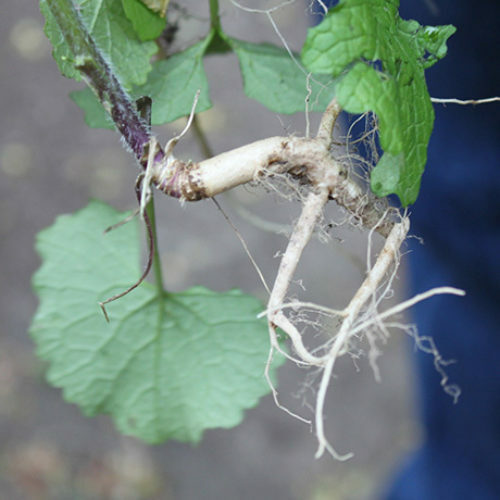 Hand pulling is an effective method and mature plants are easily pulled though care must be taken to remove all of the roots. 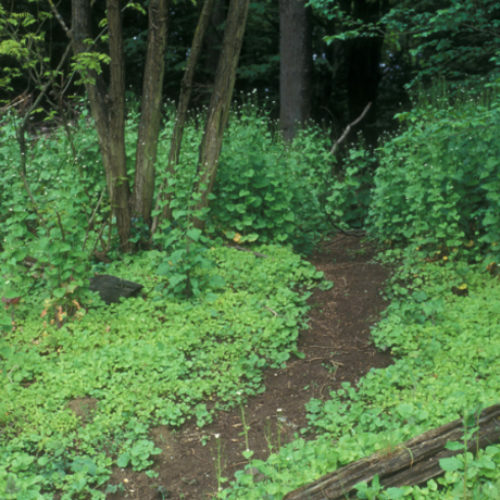 Prescribed burning is a control option for large invasions of garlic mustard.  Burning is recommended for 2 consecutive years to achieve effective control. Fires must burn hot enough to completely kill plants. 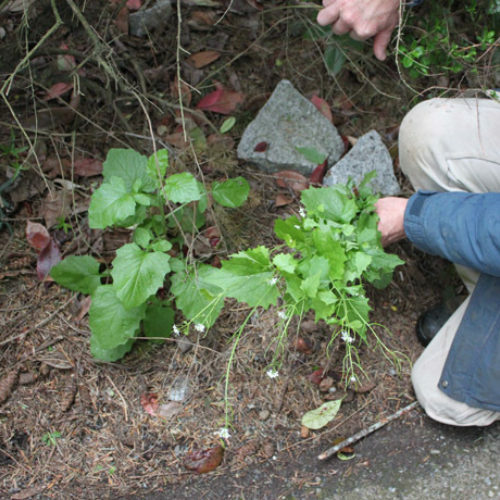 If fires are too cool, plants may regenerate from root crowns, producing flower stalks that have higher seed production and result in higher seedling survival. 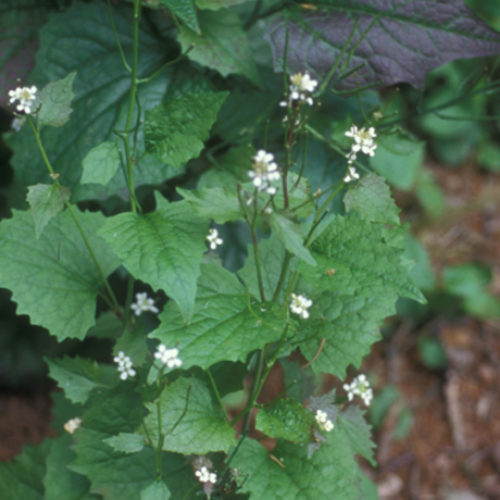 Several potential biological agents have been researched for the control of garlic mustard. They are Ceutorhyitchus alliariae and C. roberti, shoot-mining weevils that attack rosettes and bolting plants; Ceutorhynchus constrictus larvae destroys seeds; Phyllotreta ochripes, a flea beetle larvae found mining the root and root crown; Ophiomyia alliariae a shoot-mining agromyzid; and a weevil, Ceutorhynchus scrobicollis. 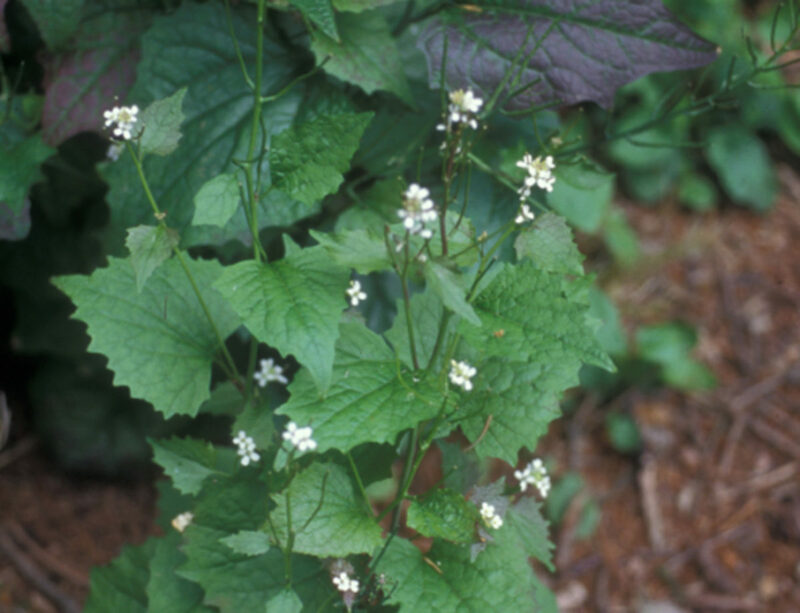 See our postcard for early detection information about garlic mustard (Alliaria petiolata). 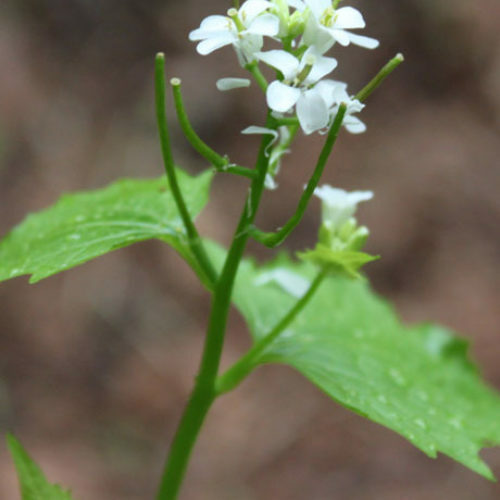 See our Written Findings for more information about garlic mustard (Alliaria petiolata). 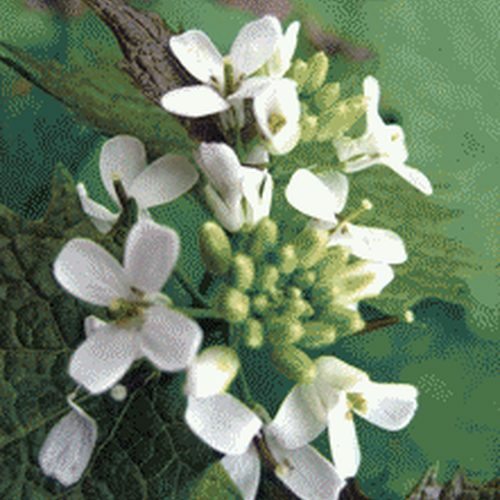 See our brochure on garlic mustard. 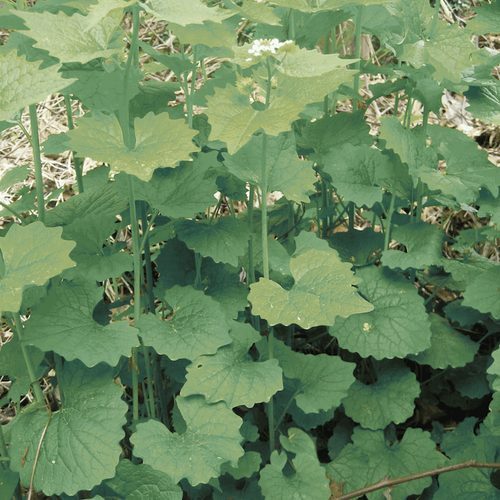 Report on garlic mustard from the book "Weed Control in Natural Areas in the Western United States"